This one's Adirondak Blue -- sorry it's a bit blurry but isn't the color amazing!? I've planted some flowers around the poor Tyson pear. 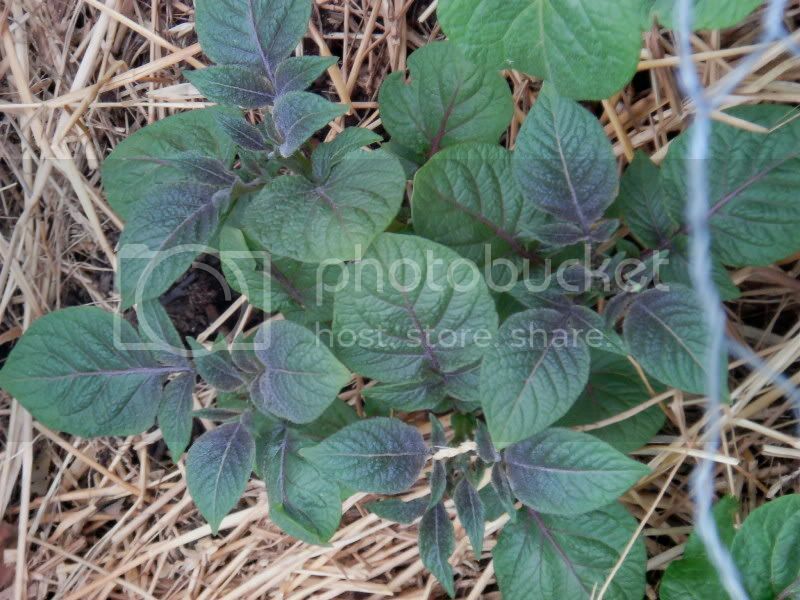 I transplanted some Purple-veined Lyre-leaf Sage here and one is starting to flower. 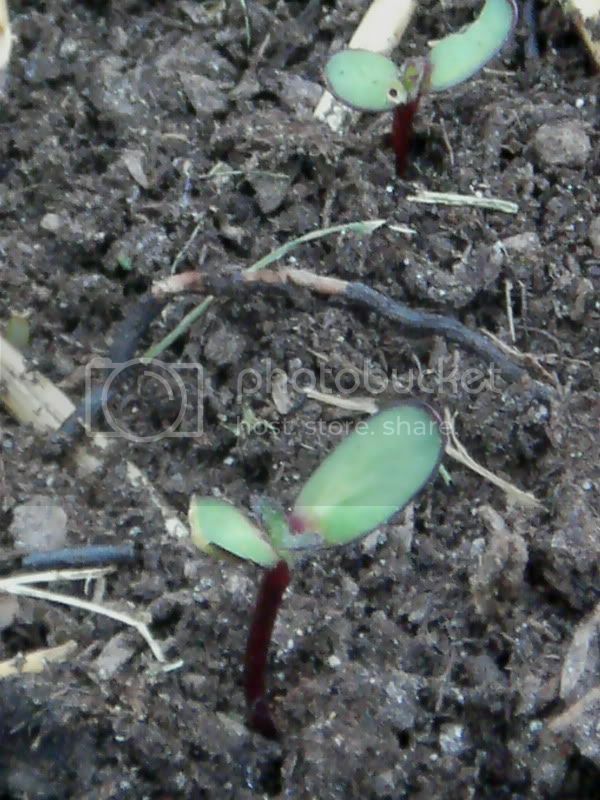 Other seedling sages are Salvia coccinea Forest Fire and Lady in Red, and perennial Wild Blue Salvia azurea. The bronze-leaved red-flowered wax begonias should play off the other colors. Your backyard sounds gorgeous! I love the amazing variety you have. I wish my plants were that successful. 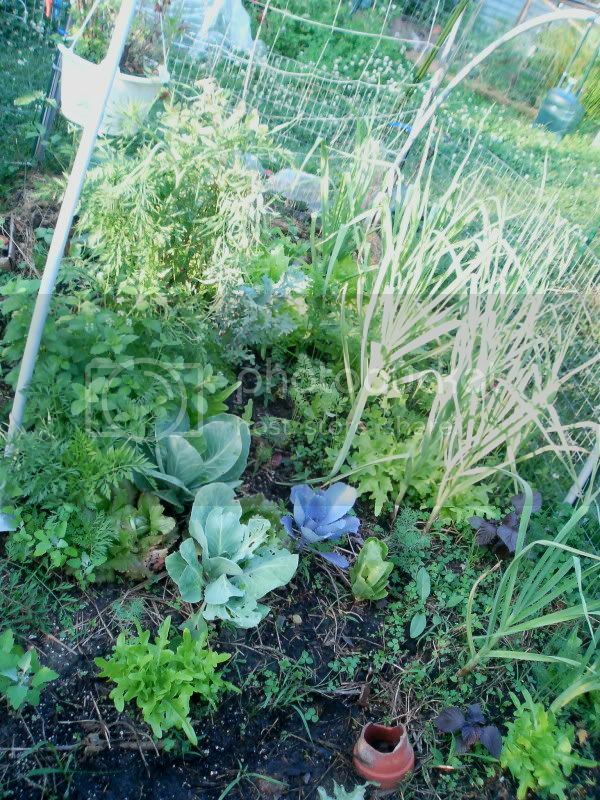 I only have a small amount of things growing but I'm wanting to do more herbs and tasty stuff. I love all the beauty of it all I want a big luscious garden like yours someday. Great use of space! LOVE ALL THIS!!!!! Awesome stuff... thanks for sharing! 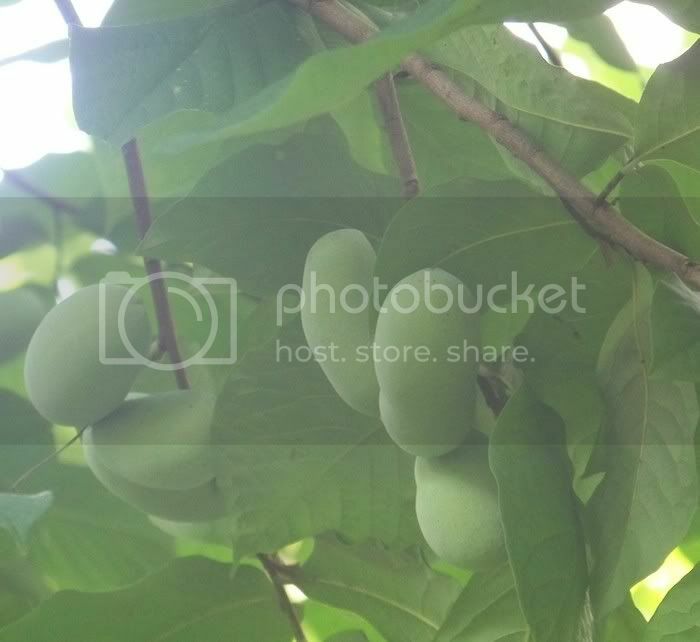 I'm jealous of the mulberries and paw paws..been trying..i have ordered mulberries more than once and they keep substituting wild plums saying the mulberry crop failed..so i gave up. and then i planted paw paws and they didn't make it..so a friend sent me ripe paw paws and i put in the seeds..but they evidently rotted or something as i still haven't seen any paw paw babies. it's just beautiful! I love a living yard. 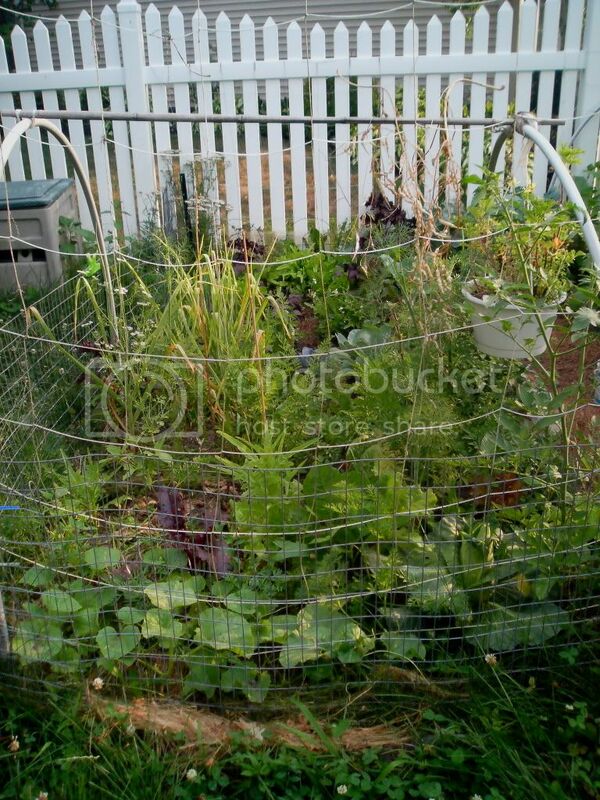 Here's an update on my Front Yard fence row featuring the chickenwire potatoe towers. DH asked me why I'm growing "silos" He is not happy. 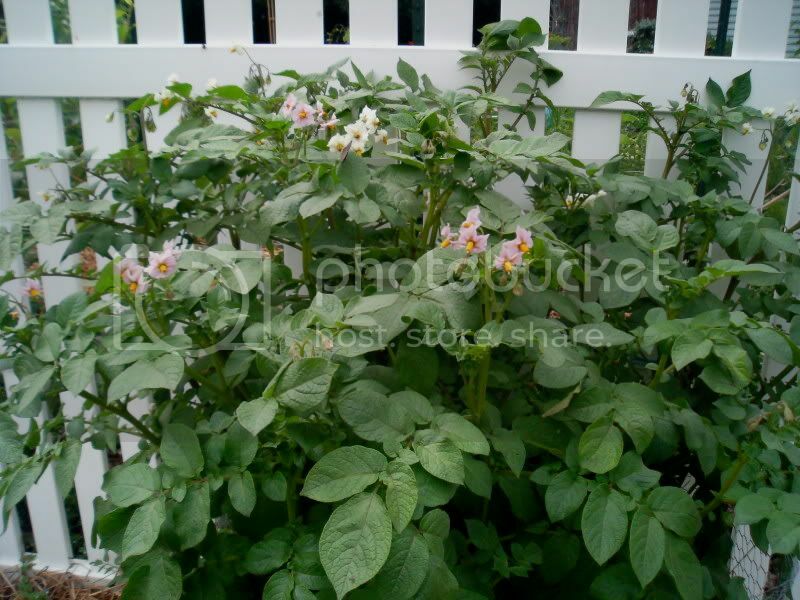 As you can see, the potatoes are starting to flower. 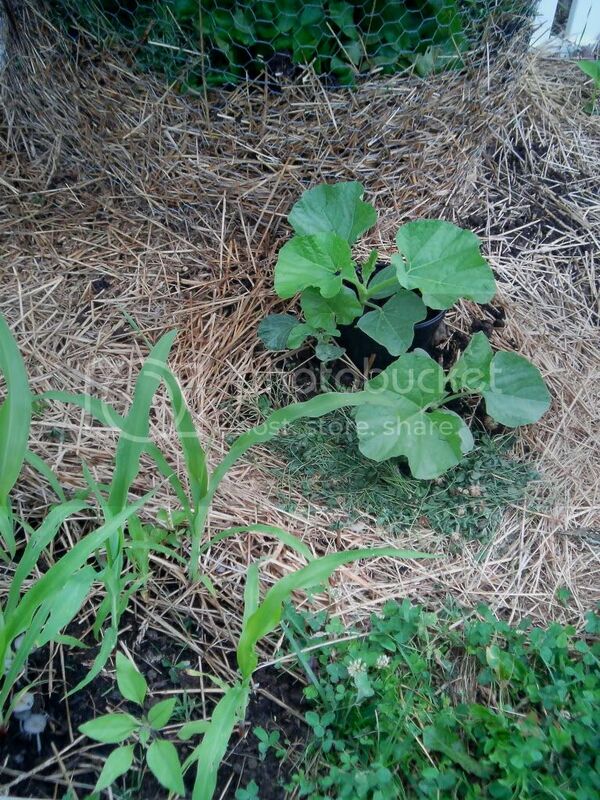 The black bottomless pot contains Bushel Gourd that just sprouted. I need to mulch this one some more. 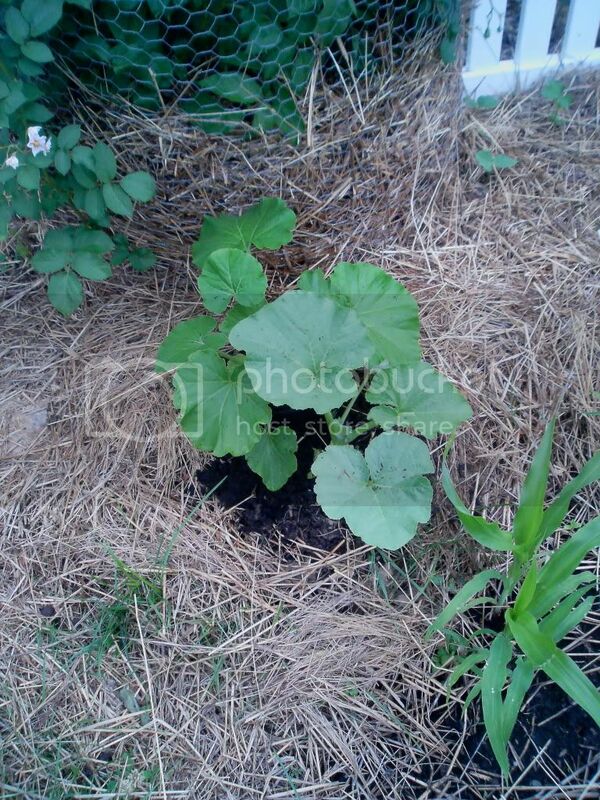 The black bottomless pot contains Atlantic Giant Pumpkins that have just grown their first true leaves. You can see the popcorn starting to grow. Oh -- I only have one sunflower left. Predation by slugs and snails (presumably) has been devastating. I've resorted to using organic slug bait/killer (Iron phosphate) after returning from 3 consecutive slug hunt mornings with a cup full of slugs and snails. 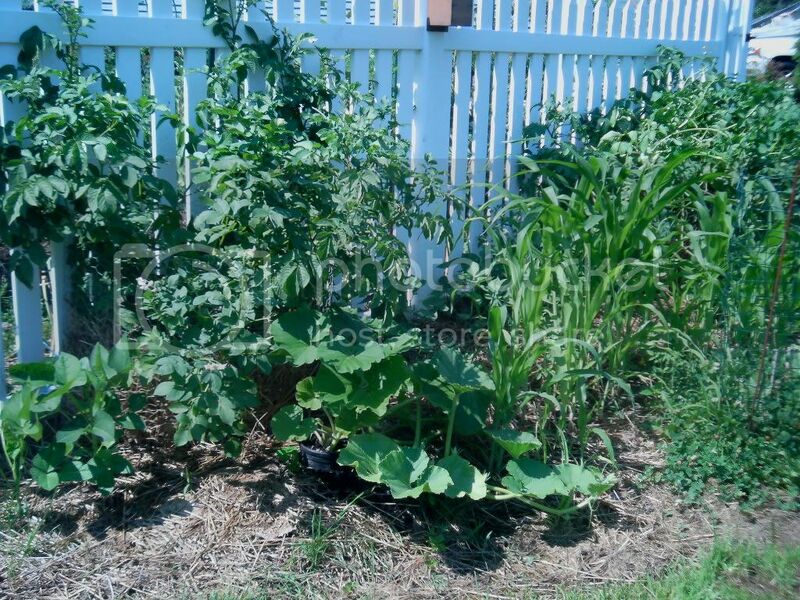 With corn and sunflowers, if they can just outgrow the slugs, they'll be OK.
Quinoa hasn't sprouted -- old seeds, Blackeyed peas have been spotty, and Azuki beans have sprouted. I guess I'll just sow more Blackeyed peas. Last edited by applestar on Wed Jun 23, 2010 3:26 am, edited 1 time in total. 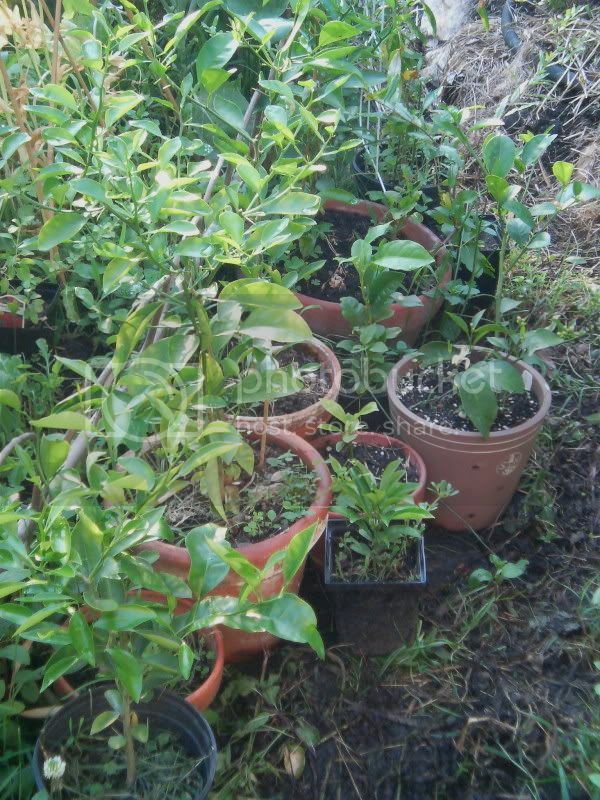 I know you were all just dying to see the Citrus Collection The newly purchased Myeri Lemon has recovered from the uppotting and is now bursting with buds/blooms. 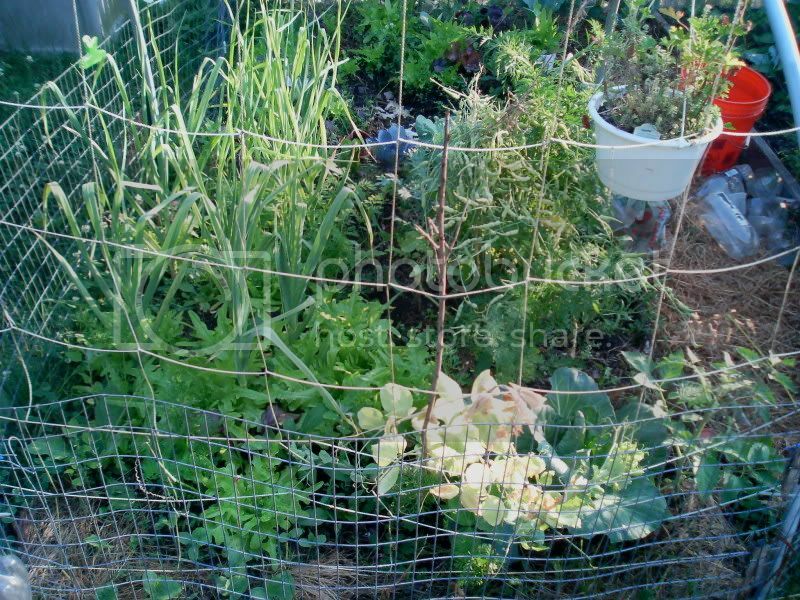 The lone pea that sprouted and grew (out of an entire row along the near string trellis) is basically done and needs to be cut down. 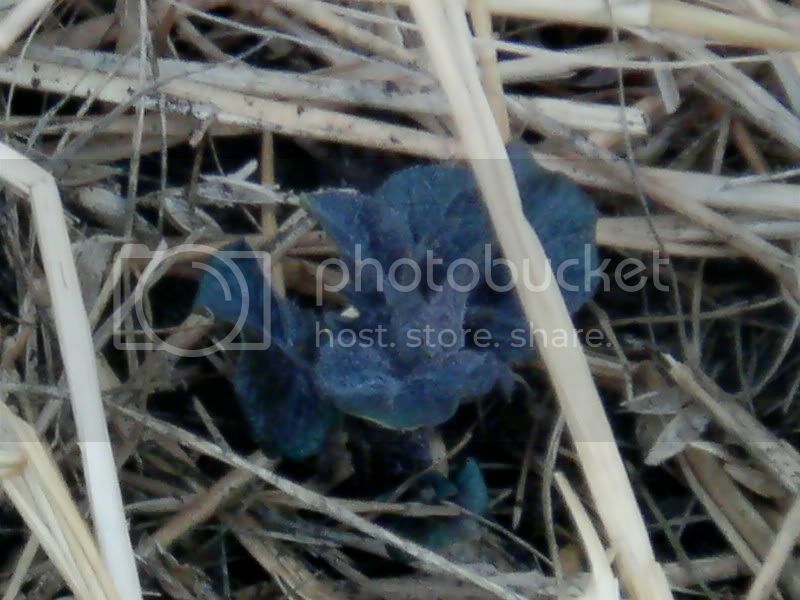 Cabbage has pretty much headed and is ready to be harvested to give the tomato room to grow. The daikon seeds are almost mature enough to cut down the plant. You can see the melon seedlings in the near left corner, poised to take over when the lettuce are gone. Yep, I gotta get that cabbage out of there. I planted a few sweet potato slips in available empty spots. Last edited by applestar on Wed Jun 23, 2010 3:30 am, edited 1 time in total. Oh. I forgot to mention that those Azuki beans were planted from a bag of organic dry beans purchased 2 years ago at a Korean supermarket. Kept in ordinary cupboard.... The Blackeyed peas are from a newly purchased packet of seeds.... I did sow 3 to a spot for Azuki and 2 to a spot for the Blackeyed, but c'mon! Azuki seedlings are growing in each and every spot! 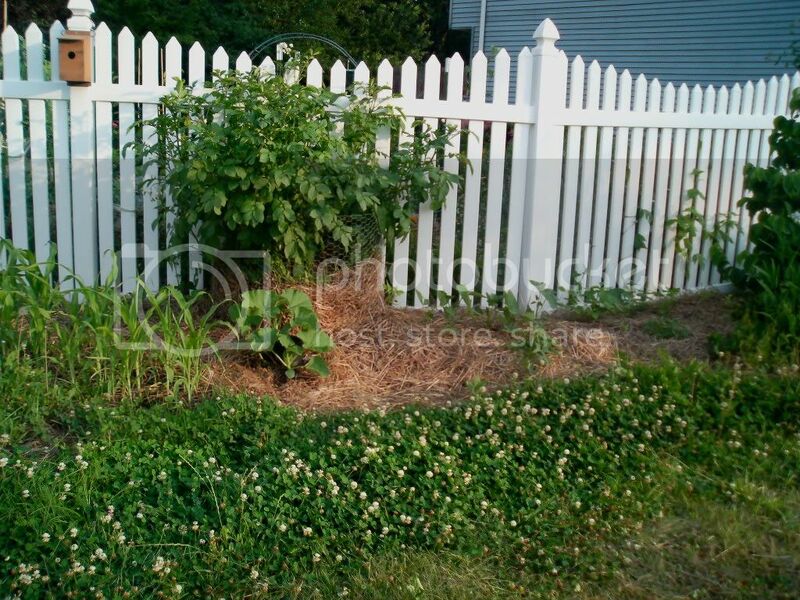 Hmm... Maybe this goes back to the Native plant vs. Non-native plant problem. Could it be that the local slugs and snails are not familiar with/unable to digest the Korean Azuki beans and aren't eating the sprouted seedlings? You may be on to something there Apple, but don't put all your chickens in one basket they will learn to eat them if they need to. By the way looking good as always. I truly admire your style. I love the beginning of the season after all the winter plans and schemes for the garden have been implemented, and they start to grow and show a promise (hopefully) of turning out the way they were envisioned. 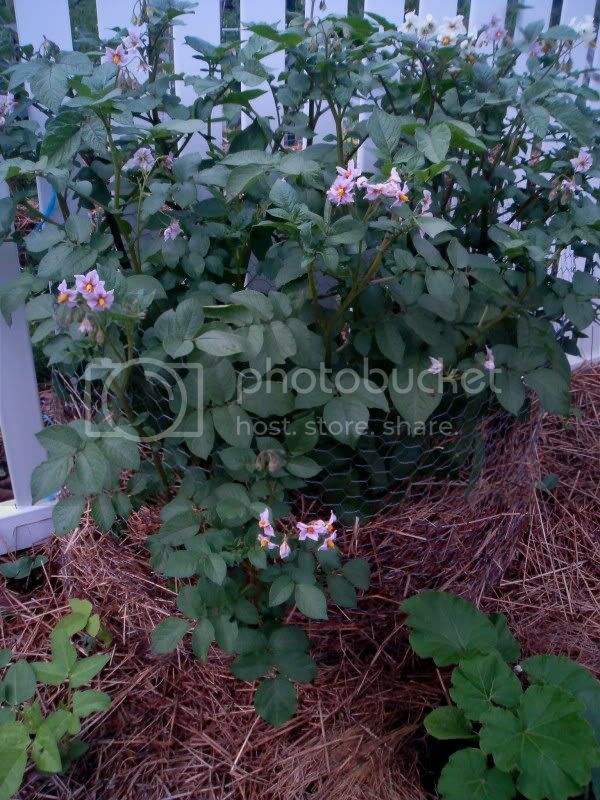 Update photos of my Potato "Silos" Potato flowers are SO PRETTY! And the bumble bees are going nuts over them -- looks like they're gathering pollen. 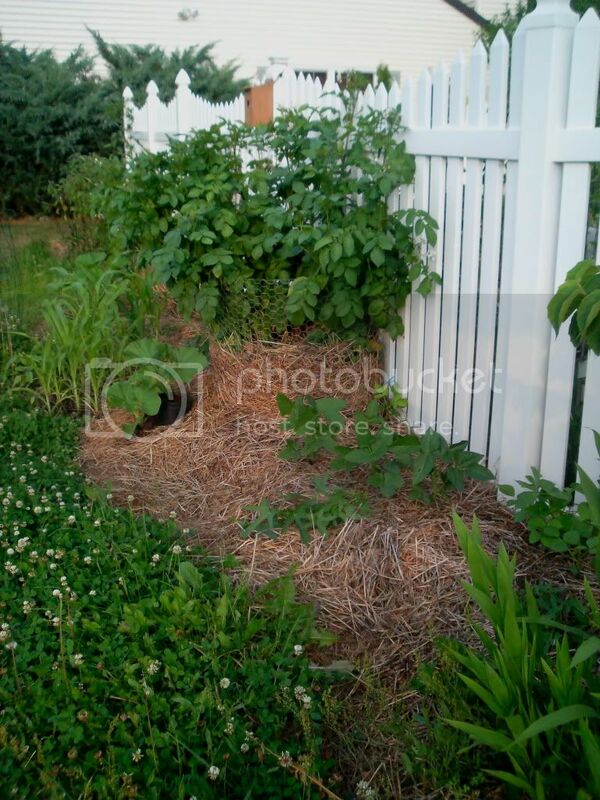 More photos of the Front Yard Edible Landscaping. Bushel Gourd. 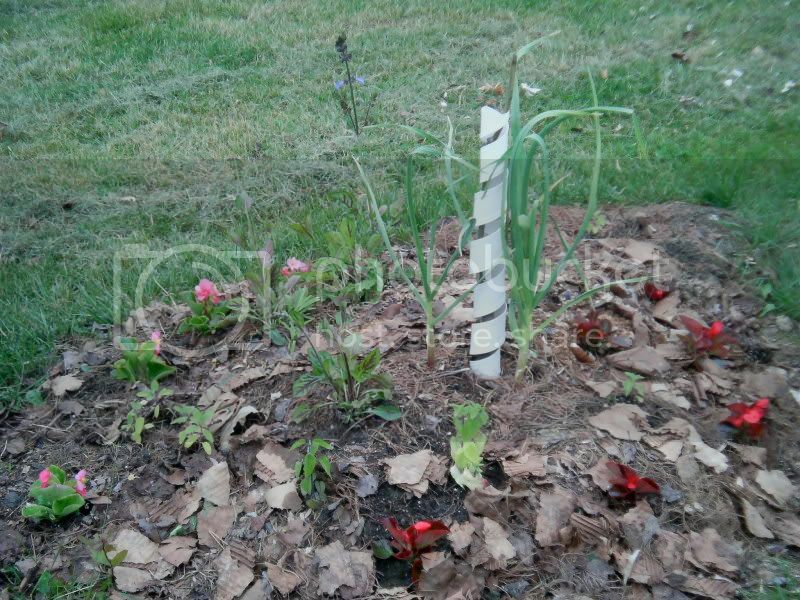 Lone remaining Chocolate Cherry Sunflower in this location in lower left corner next to some kind of mushrooms that sprung up in the Bumper Crop soil amendment used as mulch. 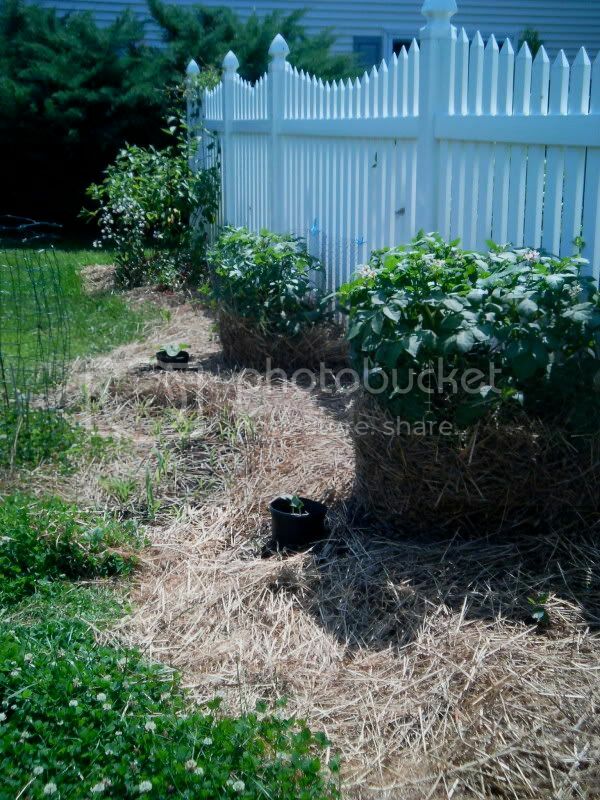 So the potatoes are in full flower now, which should mean that a month from now, they'll be harvested and the pumpkins and the gourd will have more space to sprawl (I hope I'll have the room to harvest the potatoes). 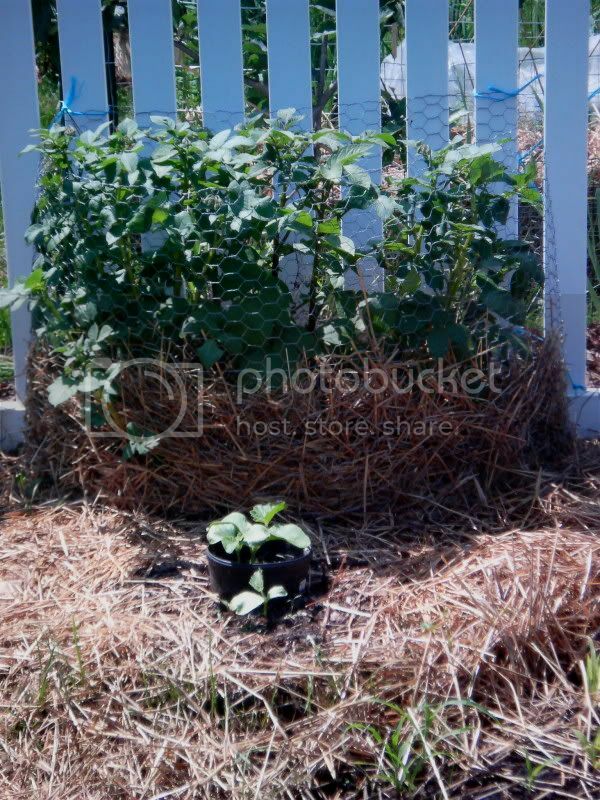 I can use the potato mulch as needed under the vines. 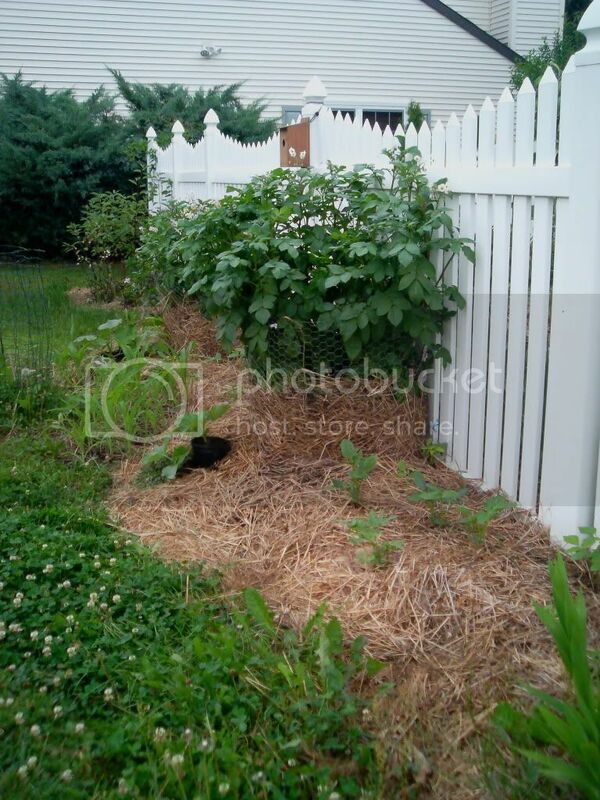 I could flatten the chicken wire against the fence in case they're inclined to climb (I don't want them getting in between the fence where the espalier are planted because there are other things planted there already). Hmm... on second thought I probably shouldn't let them climb... I momentarily forgot that these are GIANT vegs. The Bushel Gourd is also taking off in two different directions (there are 3 plants). I'll get a photo to post tomorrow. 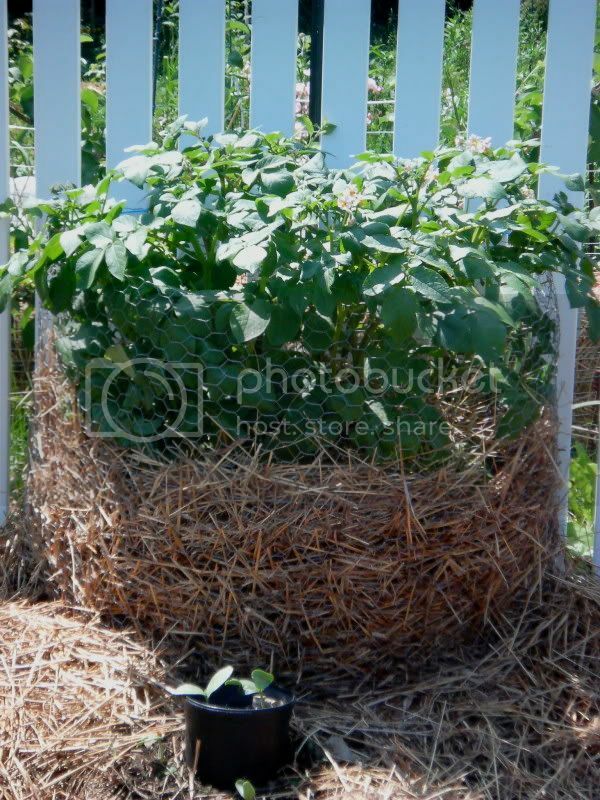 The potatoes in the far silo behind the gourd have started to flop over (they were taller than the fence) and got bent on the edge of the chickenwire fence, so I'm just piling them on top of each other inside the silo so as not to shade the beans and the gourd. Last edited by applestar on Sat Jul 03, 2010 1:17 am, edited 5 times in total. I found a tree today, that is totally loaded. 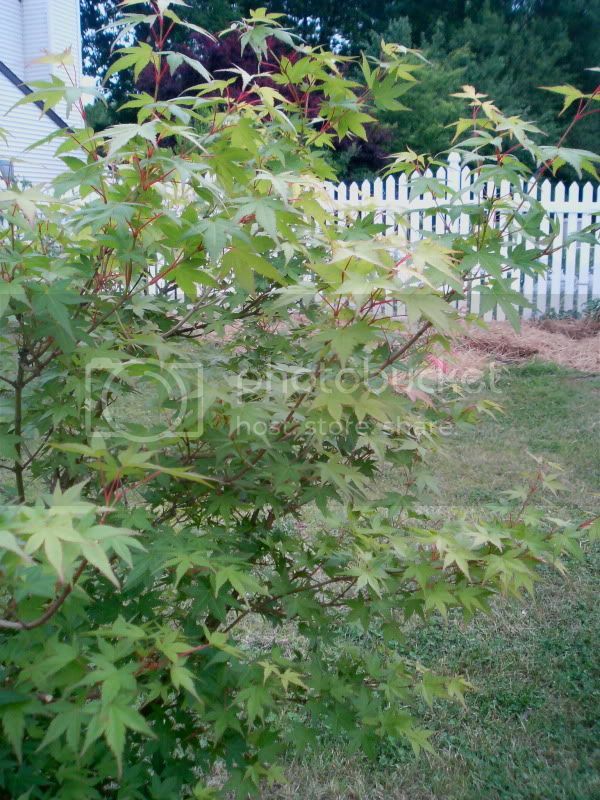 We were looking over the black cohosh, and looking for gingseng, and one tree, we both stopped and looked, it was familiar, finally, our eyes kept travelling upwards, and what was nestled up in the canopy? A harvest fit for a king! Hmmm did I say that I adore Paw paw's? If we can beat the raccoons and possums, we should have seeds for anyone who would like some. "Where oh, where is Miss Ozark Lady? ... Where oh, where is Miss Ozark Lady? .... "
Hey cool! You know it is actually a patch. 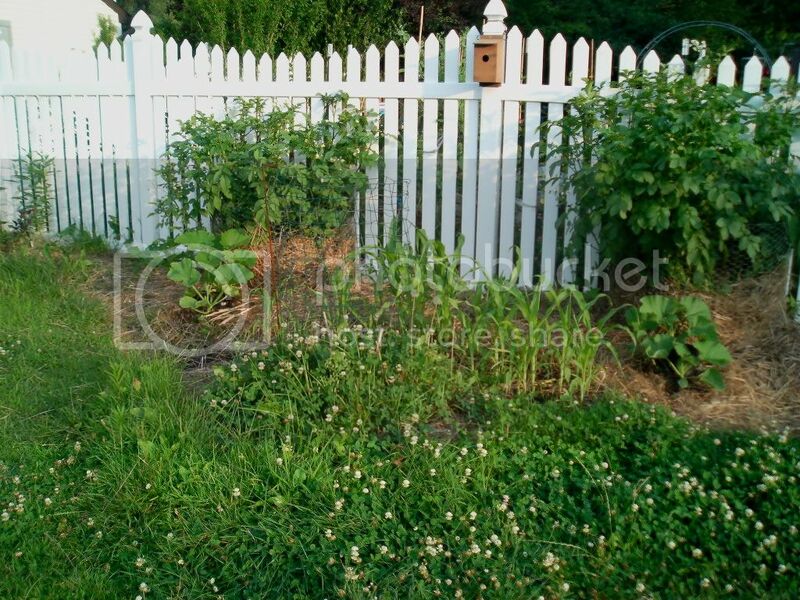 Both locations have dozens of paw paw plants, but this upper patch only has one that has fruit. I didn't mean to steal your thread. Do you want some seed when they get ripe? I do need to warn you, the foliage has a lovely appearance, but can't take sun, and they have a rank smell to the foliage. The fruits taste great! 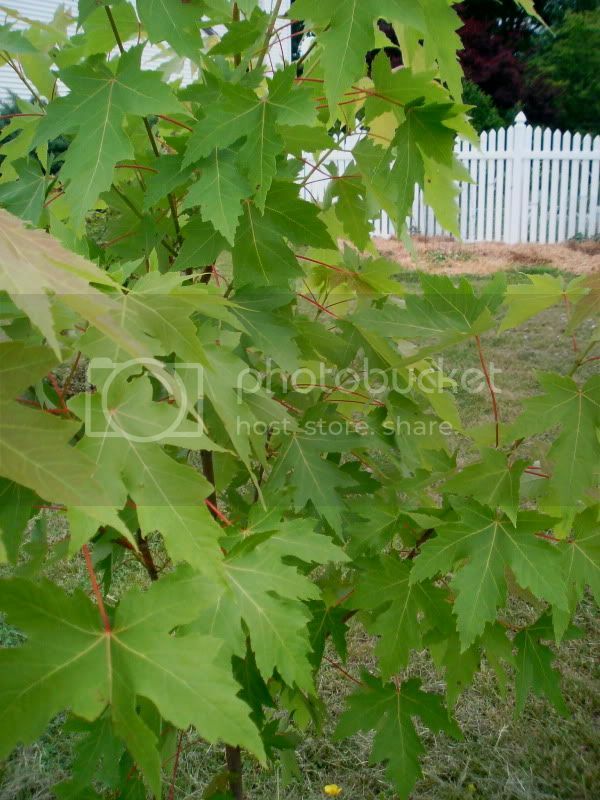 But you might need several to get one to produce, I wonder if they are alternate years, or just I have alot of male trees? These are wild, not cultivated ones.